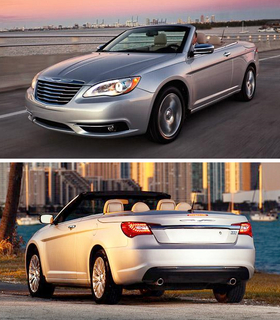 The Chrysler 200 convertible, shown, will be sold as a Lancia in Europe with cosmetic tweaks and a diesel engine option. TURIN -- Chrysler released images of its new 200 convertible, which will sell in mainland Europe as a Lancia model. The 200 will replace the Sebring mid-sized car. Lancia will unveil the rebadged 200 at the Geneva auto show in March as a sedan and convertible. It will likely be called the Flavia, company sources said. Like its sedan counterpart, unveiled in October, the base 200 convertible is powered by a 2.4-liter, four-cylinder engine. Available as an option will be a Pentastar V-6 engine, which produces 283 hp. Both engines are matched to a reworked six-speed transmission. The 200 will go on sale in the U.S. by this spring. Consumers can choose from a body-color painted steel retractable hard top or a cloth soft top, both of which can be powered by the press of a button on the key fob, Chrysler said in a press release. The Lancia Flavia convertible and sedan will launch in Europe at the end of this year or early 2012. The Lancia version of the 200 will have minor tweaks, such as a different grille and Europe-specific bumpers. On the powertain side, the models for Europe will offer a manual transmission and a diesel engine, both not part of the U.S. range, Lancia-Chrysler CEO Olivier Francois said earlier this month. The 200 will have a Chrysler badge in the UK and Ireland, where Lancias are not sold. Fiat, which controls Chrysler with a 25 percent stake in the U.S. carmaker, is integrating Lancia with Chrysler. Marchionne plans to almost triple combined Lancia-Chrysler sales in Europe to 300,000 units in 2014 from about 110,000 last year.